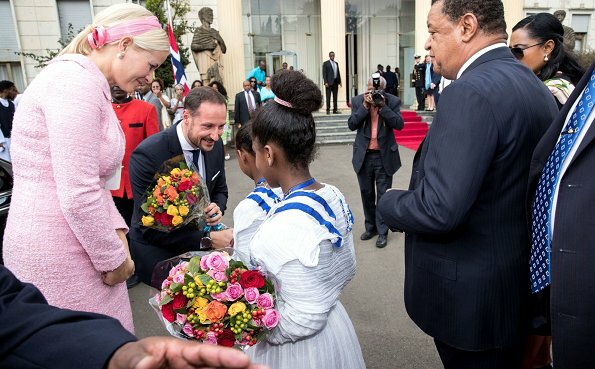 Ethiopia visit of Crown Prince Haakon of Norway and Crown Princess Mette-Marit of Norway started. 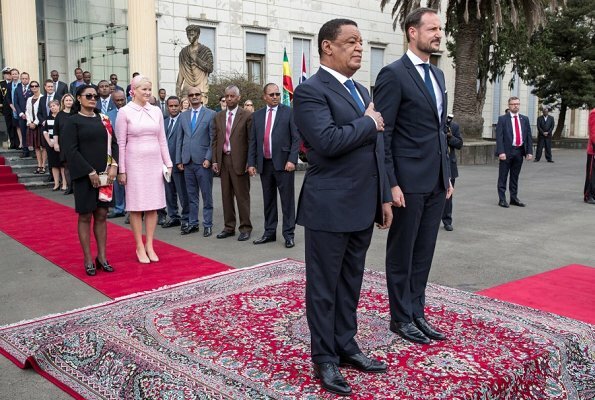 Norwegian Crown Couple was welcomed by President of Ethiopia, Mulatu Teshome Wirtu with an official ceremony at the National Palace. 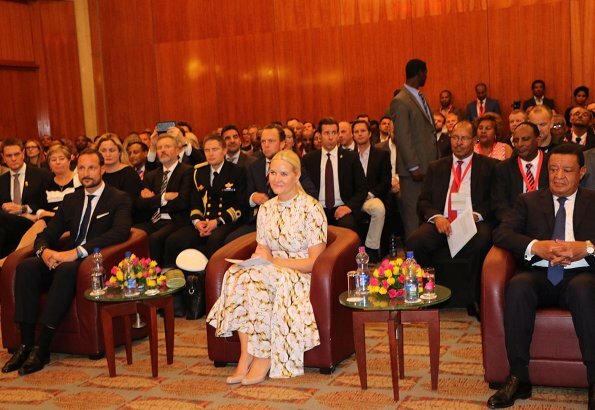 The Crown Couple currently makes a 3 day visit to Ethiopia upon invitation of President Mulatu Teshome Wirtu. 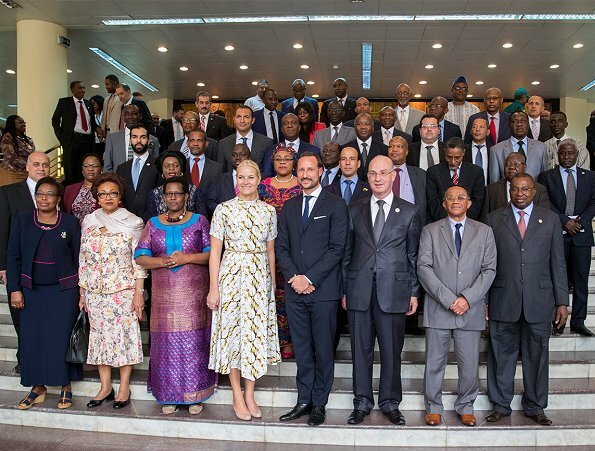 First two days of the visit take place in the capital, Addis Ababa with various events. 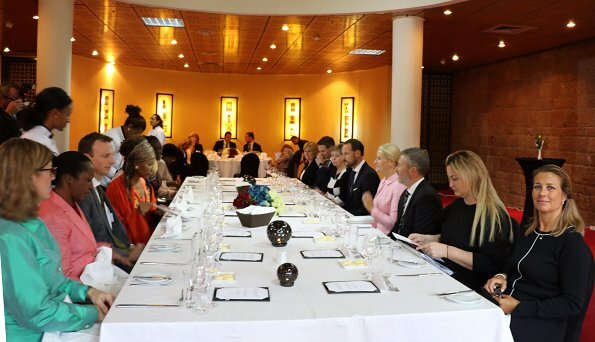 The visit will end on Thursday with a visit to be made to the refugee camp in Shire in the north. 07 November 2017. 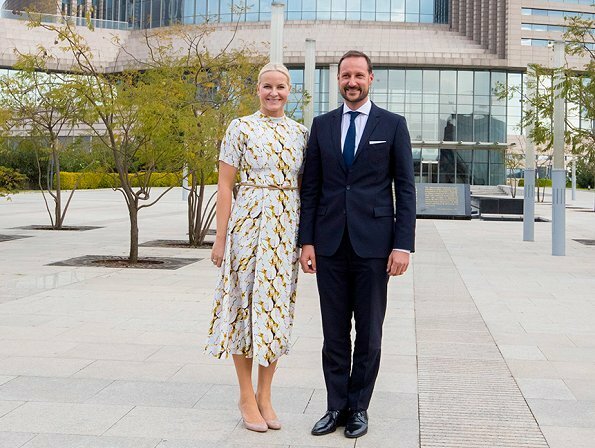 Crown Prince Haakon and Crown Princess Mette-Marit, State Secretary in Norway's Ministry of Foreign Affairs, Tone Skogen and Norway's Ambassador in Ethiopia, Andreas Gardner held a meeting about the visit program at Embassy of Norway in Ethiopia. 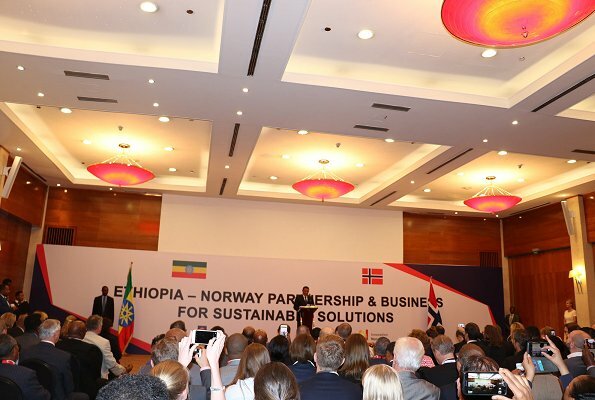 Crown Prince Haakon and Crown Princess Mette-Marit attended a Business Forum (Ethiopia-Denmark Partnership & Business For Sustainable Solutions) held at Hilton Hotel in Addis Ababa in the afternoon. 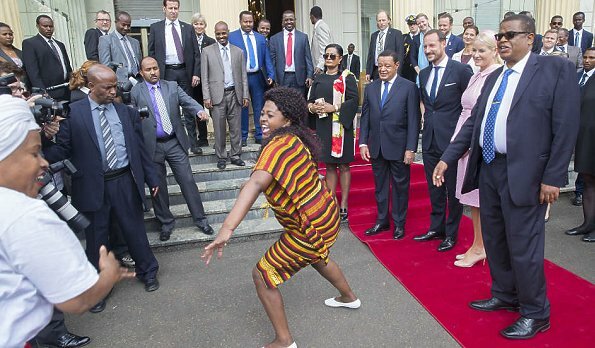 MM's poor standing posture and an ill-fitting pink dress ruin her appearance on arrival. 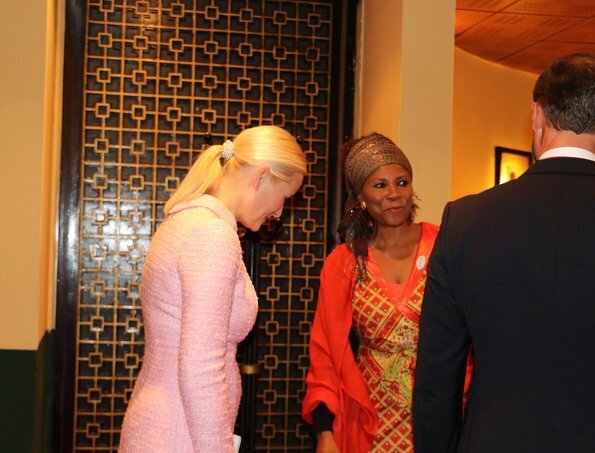 However, the gold and white dress in the 8th photo is very pretty on her and much more flattering. The pink dress is way too tight on her. 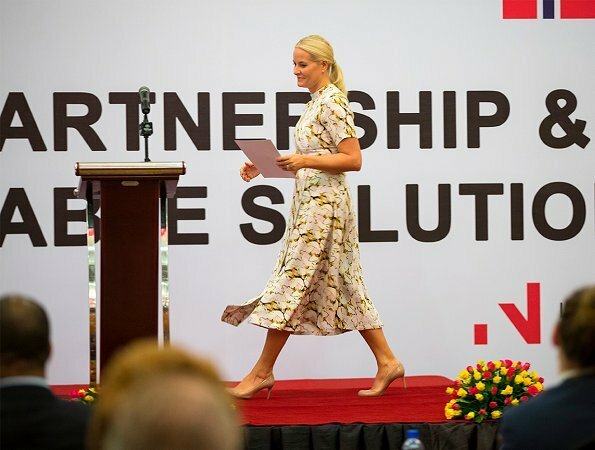 The fourth photo is very weird because of all the other people around her (some raised as if to pay respect to a speaker or so, some seemingly collapsing or feeling poorly in the first row, someone walking off, and the photographers kneeling in the middle...), but it´s nice to see Mette-Marit sitting straight and exhibiting a good posture for once. I agree that the white dress in the second-to-last picture looks promising, but I would have to see it properly to make a judgement. 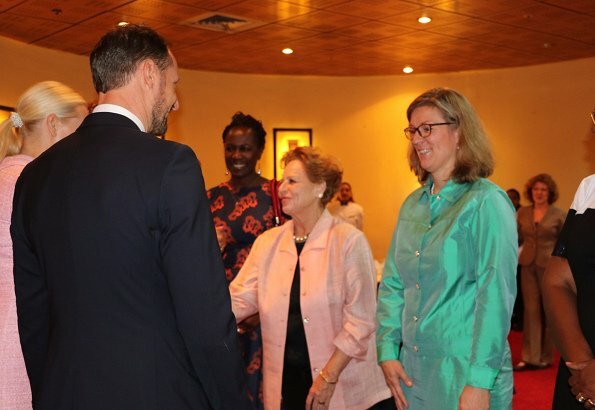 I just wish she would steer clear of those tight-around-the-neck t-shirt-like necklines that seem so constricting and make her appear all closed-off. The 2nd dress is very flattering on MM, lovely style. The pink dress is not a success. Too tight, too pink! I like the second dress which looks nice on her, except for the high, tight neckline. That is a hard style to wear as it is so severe and often not flattering to the neck or face. I like both dresses. Pale pink is so becoming color to her.